By Kori ~ July 19th, 2012. Would you like a quick suggestion for a good wine to drink tonight (or this weekend) that wonâ€™t break your budget and is widely available? Many of our readers have said this is something they would like, so here is this weekâ€™s selection, the 2011 Ecco Domani Moscato from Italy. 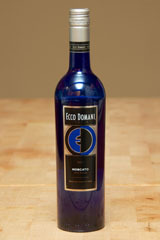 Ecco Domani, which means â€œhere’s tomorrow,â€ produces contemporary style wines from distinctly Italian grape varieties. Fabrizio Gatto, head winemaker for Ecco Domani since the 1995 vintage, and his team strive to create wines that exhibit the best that Italy has to offer. Since Ecco Domani’s debut in 1996, it has become the leading premium imported brand in the United States. Moscato has a long history of growing in northern Italy where the cool temperatures are ideally suited to bringing out the best characteristics from this aromatic variety. While there are many sub-varieties of Moscato grown in the world, it is the small-berried Moscato Bianco grape, also known as Moscato di Canelli, that is considered best and it forms the base of this wine along with the sweet Moscato Giallo. The fruit is sourced predominately from the Friuli Venezia Giulia with a portion from Trentino and the Colli Euganei in the Veneto. 2011 Ecco Domani Moscato (Delle Venezie IGT, Italy): Medium yellow in color. Aromatic with sweet apricot, honey, and floral notes on the nose. More apricot, honey, and orange blossom come through on the palate. Semi-sparkling, medium-bodied, and sweet with lively acidity and a long finish.